With flickering candles illuminated by real LED lights, this nostalgic lighted American Pride canvas celebrates America’s triumphant beginning—featuring George Washington’s Old Glory, with a 13-star circle symbolizing “a new constellation”. The gallery-wrapped lighted canvas requires no frame or cords, and its side on/off switch lets you activate the lights without removing it from the wall. The wood frame stretched canvas print is 3/4″ thick and includes two sawtooth hooks for hanging. Uses 2 AA batteries (not included). 20″ long x 14″ wide. This beautiful rendition of God & Country by artist Billy Jacobs takes on brilliant new dimension when its candle glows with built-in LED lights. 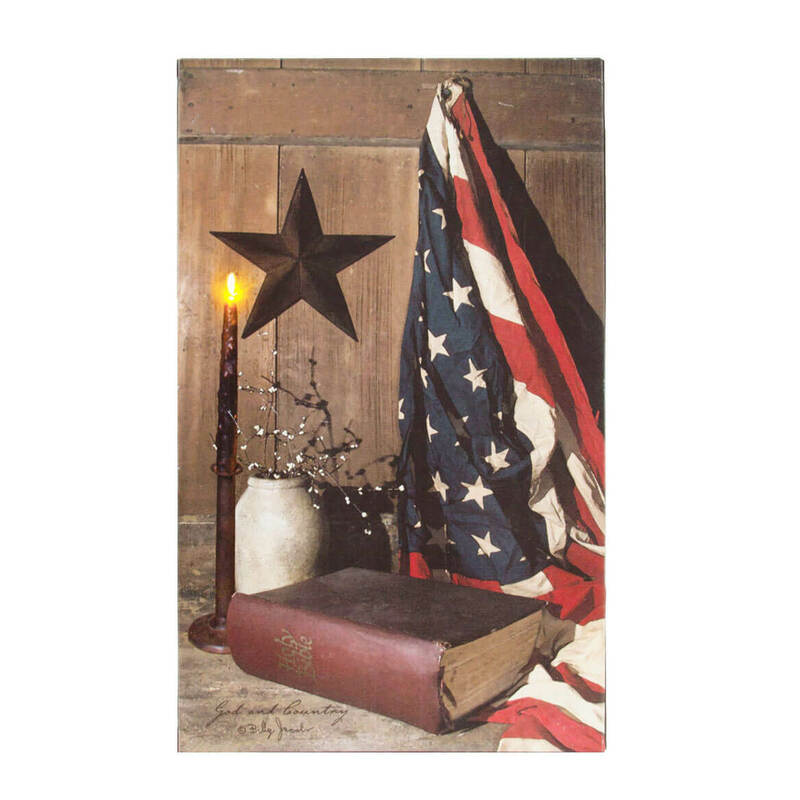 A stunning image of simple American values, the lighted God & Country canvas enhances any home with patriotic pride. The gallery-wrapped lighted canvas requires no frame or cords, and its side on/off switch lets you activate the lights without removing it from the wall. The wood frame stretched canvas print is 3/4″ thick and includes two sawtooth hooks for hanging. Uses 2 AA batteries (not included). 20″ long x 12″ wide. 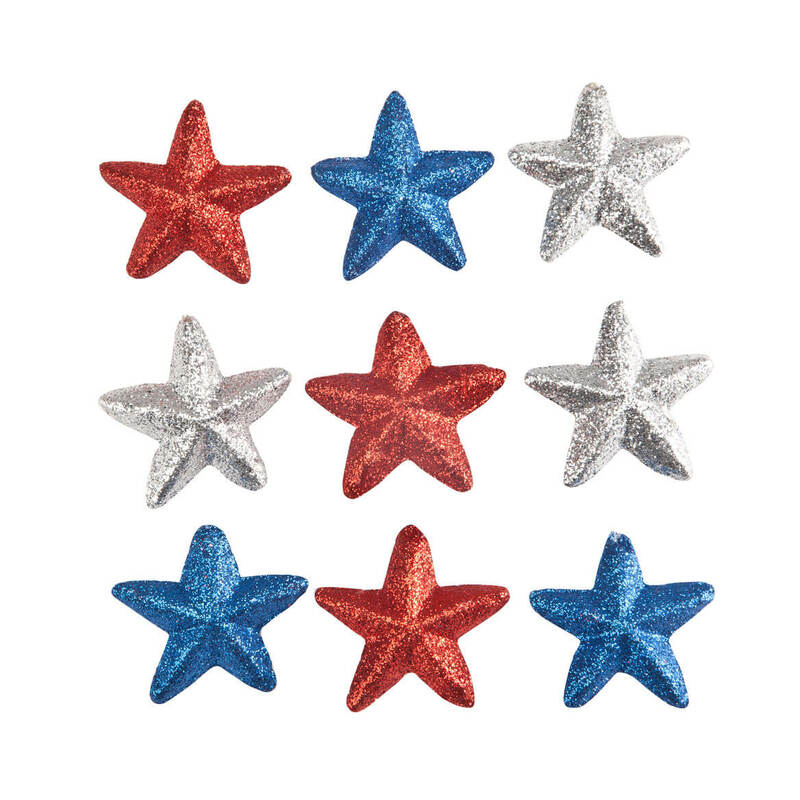 Adding instant “star power” to any patriotic display, this set of nine patriotic star ornaments will dazzle and shine—making decorating easy and affordable! Sparkling in red, blue and silver, our glittered tree ornaments feature attached hanging loops for easy display. Instantly transforming our White Wire Tree (sold separately), the versatile holiday decorations also lend patriotic style to a wreath, centerpiece, chandelier, mantel and more. Plastic/styrofoam. Set of 9 includes 3 red, 3 blue, 3 silver. Each, 1 3/4″ dia. with 3 1/2″ long hanging loop. 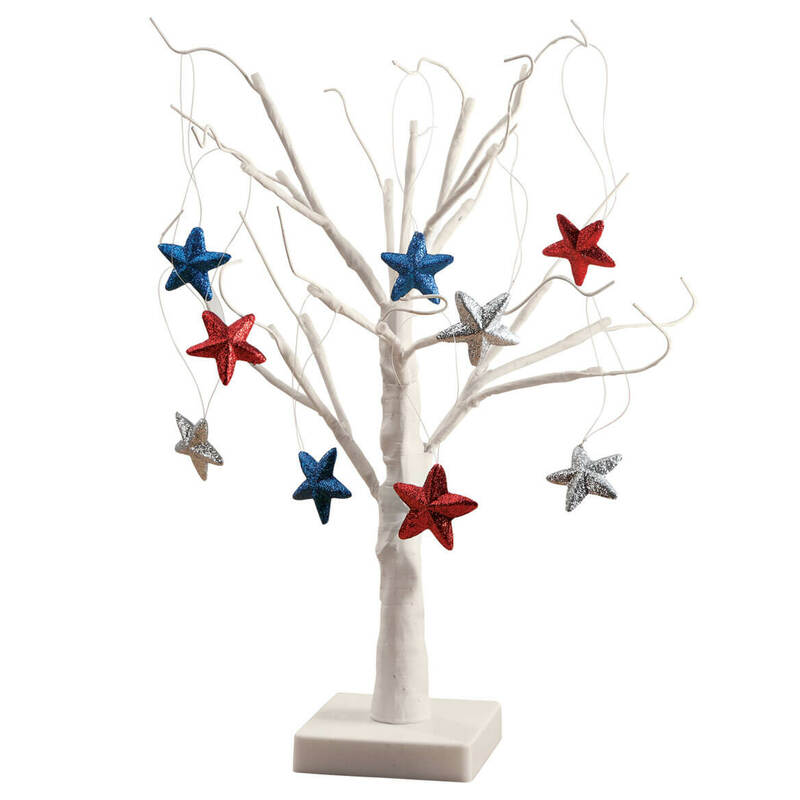 Illuminated with white LED lights, this white wire 18″ tree with star ornaments ornaments is perfect for adding instant “star power” to any patriotic display. The wire branches blend beautifully with decorations. Pre-lit with 18 LED lights, it features on/off switch and timer (6 hours on/18 hours off). Uses 3 AA batteries (not included). 18″H. Ornaments are plastic/styrofoam. Set of 9 includes 3 red, 3 blue, 3 silver. Each, 1 3/4″ dia. with 3 1/2″ long hanging loop. Old Glory has never been more dazzling … shining with 10 miniature lights sparkling through a prismatic surface! 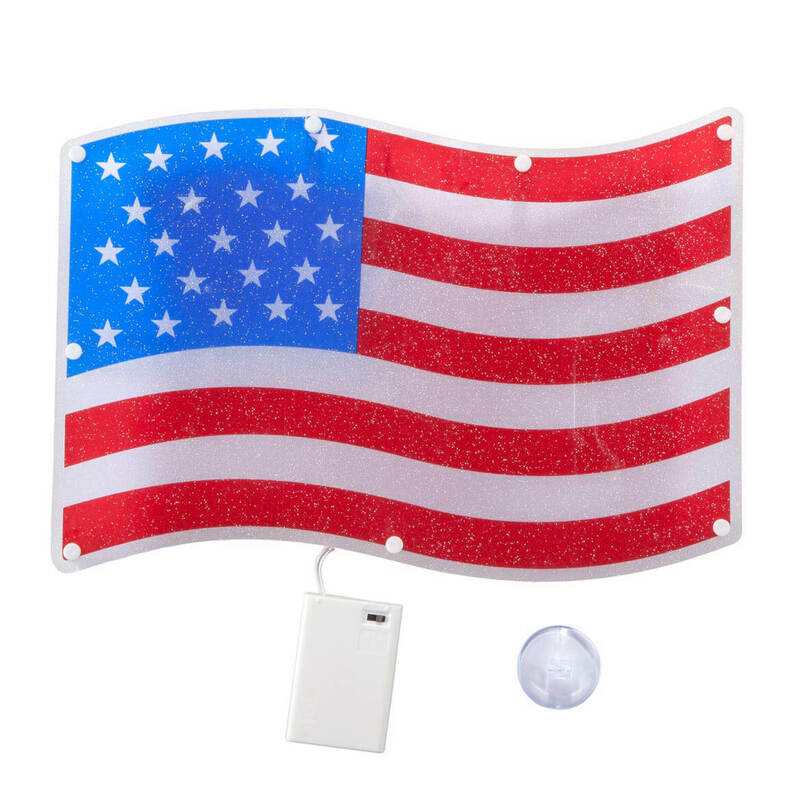 Offering quick, brilliant display for patriotic holidays or any day, our star-spangled American Flag shimmer light is battery operated, and includes a suction cup for easy, cord-free mounting to windows, doors or walls. Designed for indoor/protected outdoor use; window light requires 3 AA batteries (not included). Plastic. Holiday light measures 13″ wide x 8 1/2″ high. 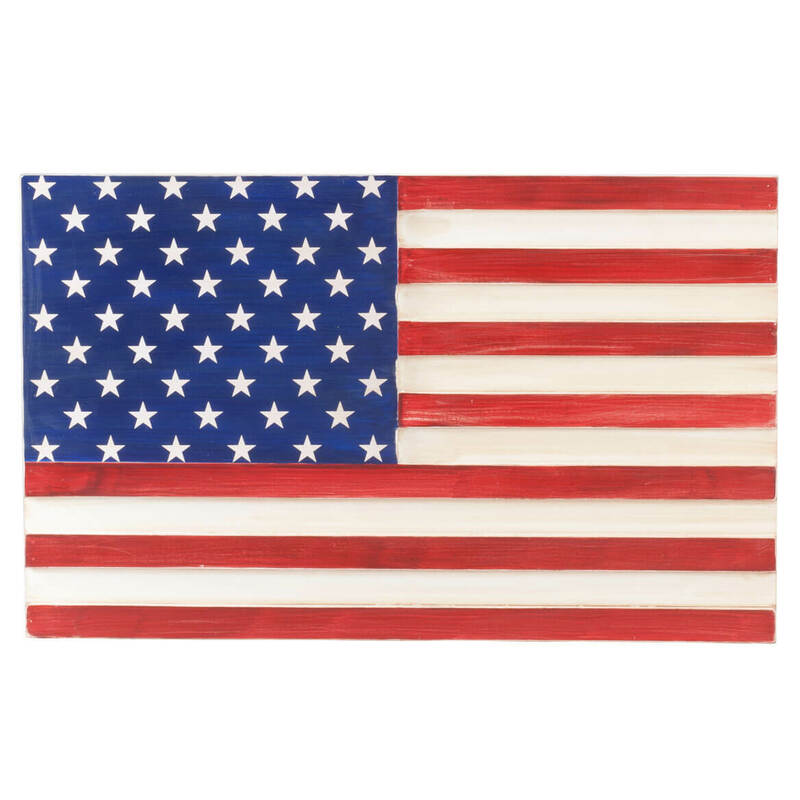 Proudly crafted of solid wood, our American Flag wood plaque celebrates your patriotic spirit in artful style! Exclusively designed with recessed white stripes for depth and dimension, wall plaque boasts 50 stars and 13 stripes in bold red, white and blue. 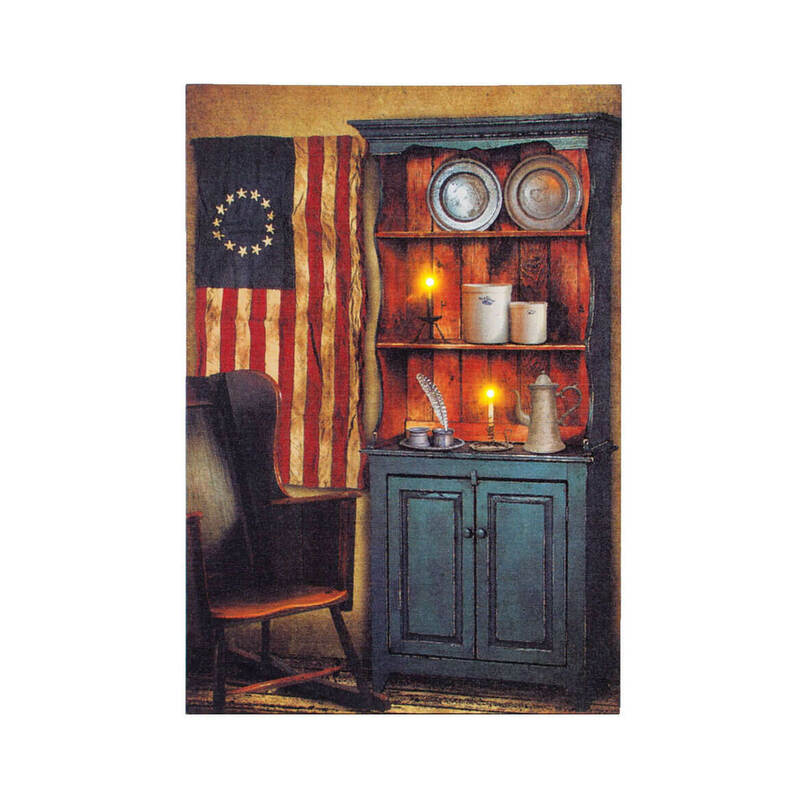 A classic home accent inspiring pride on patriotic holidays and all year long, the solid wooden plaque features two sawtooth hooks for indoor/protected outdoor display. 11 3/4″ long x 18 7/8″ wide. 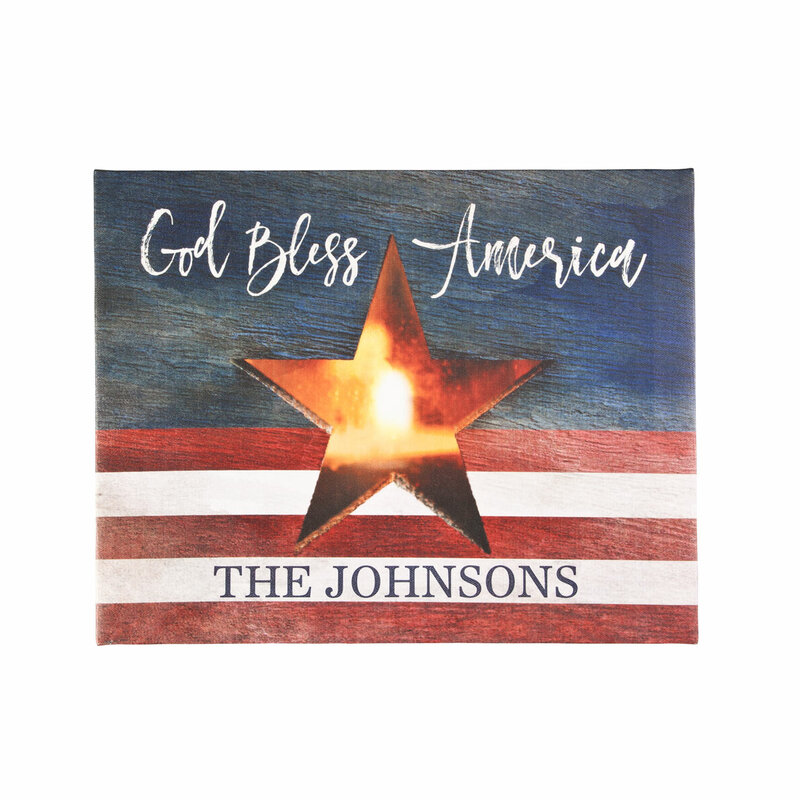 Graced with patriotic spirit, our exclusive personalized lighted patriotic canvas by Northwoods™ shines as a personalized treasure … and sparkles with real light! Beneath “God Bless America”, the bold star’s candle glows from a built-in LED bulb. No frame or cord needed for easy display; the lighted canvas uses 2 AA batteries (not included). Side on/off switch lets you activate without removing canvas from the wall. This exclusive LED canvas art will be custom personalized at no extra charge—making it yours alone! Specify name/message; limit 1 line, 18 letters/spaces. Includes sawtooth hanging hooks. 11″ long x 14″ wide. 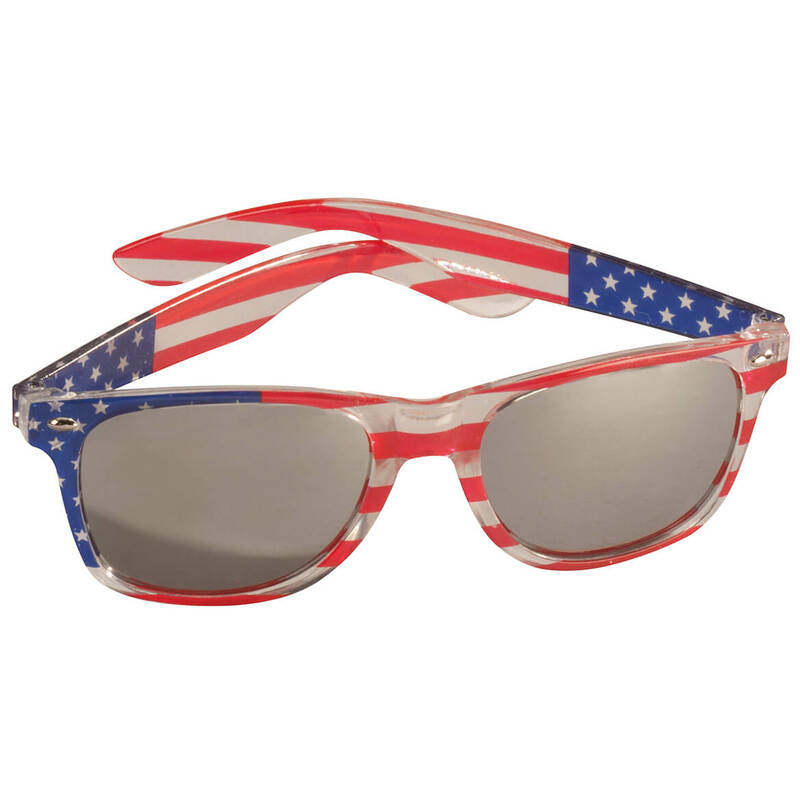 Protecting your peepers in proud American style, these star-spangled Patriotic Sunglasses are fun for holidays or any day! Great for 4th of July parades, parties, picnics and more, these American flag sunglasses are light, comfortable and so affordable, you can pass them out to party guests. In durable plastic; one size fits most (ages 14 and up). 6″ wide with 6″ long arms; lenses approx. 2″ high. Designs vary slightly; we’ll choose for you. Creating bold patriotic display is quick, easy and affordable with our versatile American flag bunting. Adding star-spangled spirit to your home or landscape, the classic flag bunting can be gathered in a variety of ways to create different looks—draped over deck railing or fence, suspended from a mantel or banister, gracing your home’s entryway and more. 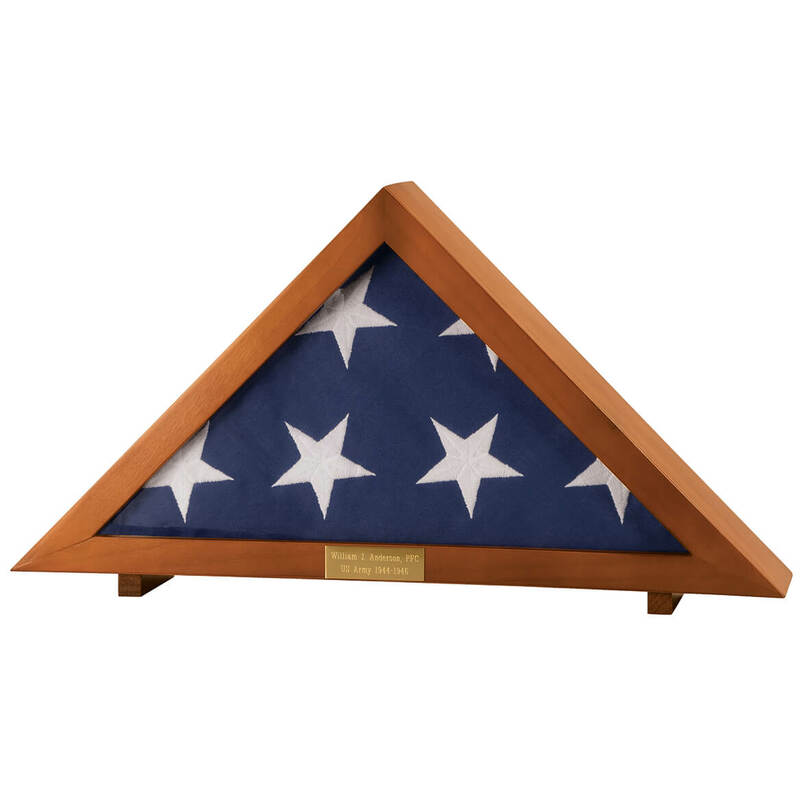 Perfect for patriotic holidays or any day, the bright, durable bunting features 50 proud stars plus red, white and blue stripes. 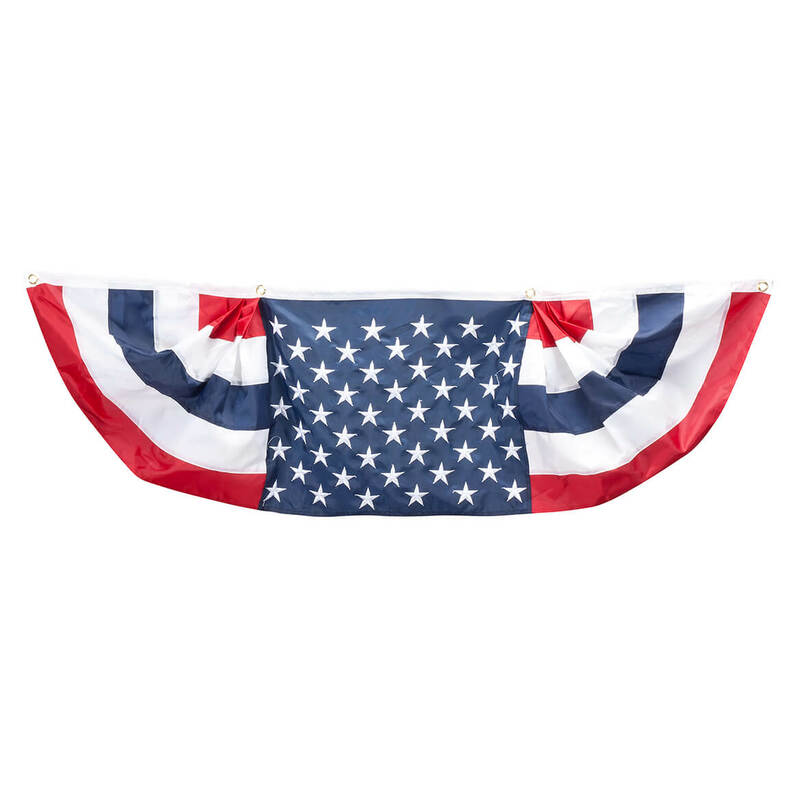 The weather-resistant indoor/outdoor patriotic bunting is crafted of 100% nylon with metal grommets for easy hanging. Display several together for an impressive look (each approx. 60″ x 18″; sold separately). Hand wash.